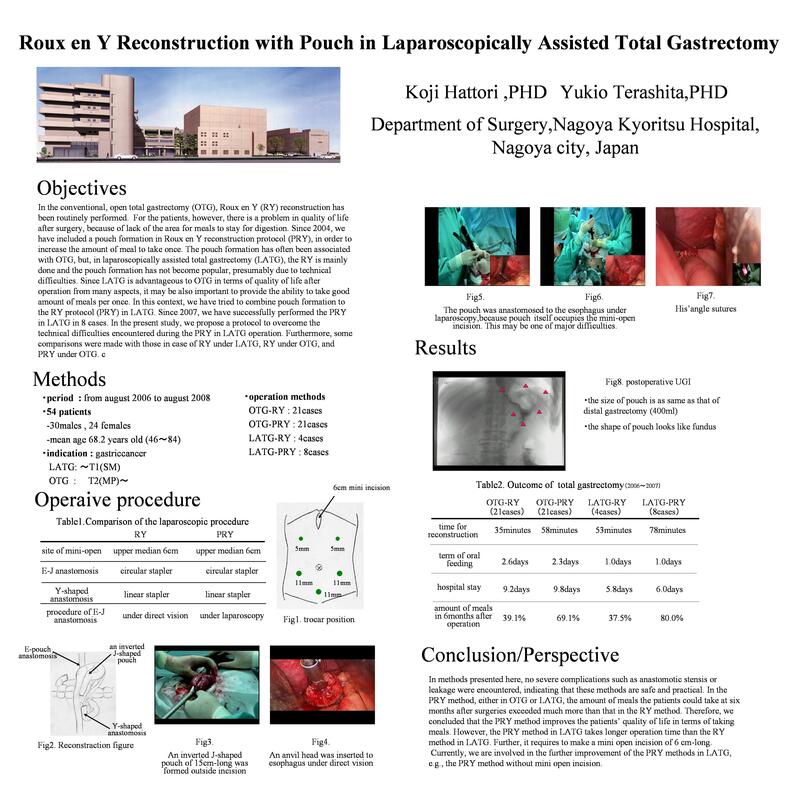 [Introduction] In laparoscopically assisted total gastrectomy (LATG), Roux-Y (RY) reconstruction has been performed. We have performed pouch with Roux-en-Y (PRY) reconstruction in LATG on eight cases since 2007. We demonstrated the techniques in the surgical procedure by photos and compared them with those used in the RY method. [Point of the procedure] Under the laparoscope, the jejunum was marked at the position of 20 cm and 80 cm from the Treitz ligament (Treitz lig. ), and a 6 cm midline incision was made in the epigastric region. The 20 cm jejunum from the Treitz lig. was dissected outside the incision, forming a Y-shaped anastomosis to the 80 cm jejunum, which was placed back in the abdominal cavity. An inverted J-shaped pouch 15 cm in length was formed outside the incision, which was anastomosed to the esophagus under direct vision. A His’ angle was formed, and the elevated jejunum was connected to the duodenal stump with sutures. [Results] The average reconstruction time during the operation was 78 minutes in the PRY method and 53 minutes in the RY method; both methods had no postoperative complications. The average durations of postoperative hospitalization were 6.2 days in the PRY method and 5.8 days in the RY method. Six months after the operation, the oral intake of one meal was more than two-thirds in all cases who underwent the PRY method compared with that before the operation.